Enjoying the ride is what motorcycling is all about and having a helmet that is comfortable and safe is just facilitates that enjoyment. The Shoei GT-Air has been designed from the ground up to be the ultimate all-rounder. With a fully adjustable ventilation system, drop-down internal sun visor, fog-free Pinlock CNS-1 face shield and Shoei’s legendary comfort and quality, the GT-Air has all of the features you need to keep your focus on the road instead of on the discomforts a lesser helmet can cause. 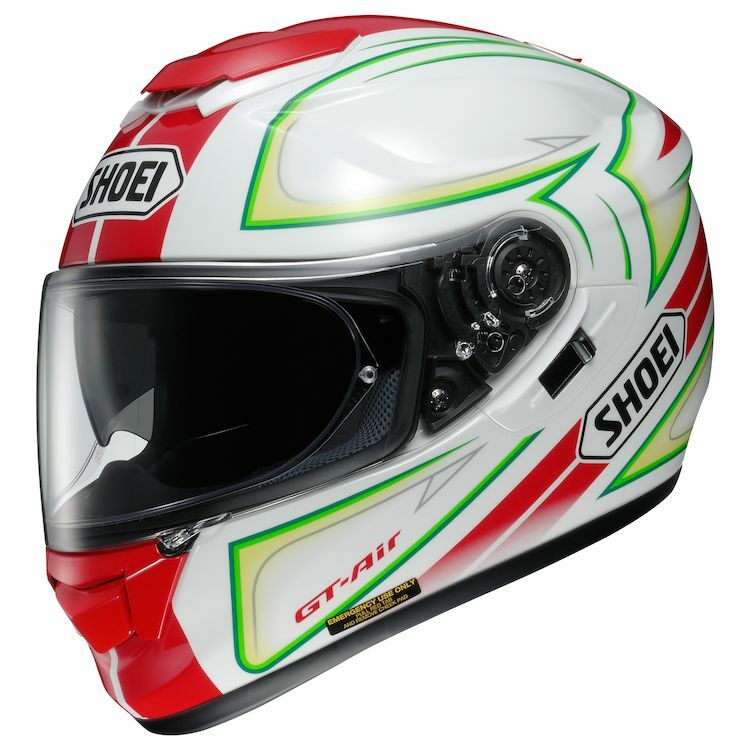 The Shoei GT-Air was developed using wind-tunnel testing at Shoei’s state-of-the-art facility in Japan which lead to an aerodynamically tuned tri-composite shell that mitigates buffeting, as well as wind and road noise. The plush removable liner is comfortable, quiet and removable when you need to wash it. Light, safe and comfortable, the Shoei GT-Air meets and exceeds the needs of contemporary riders, allowing them to enjoy what they love most…the ride. My third helmet and most expensive one yet. Got it on sale so was a great price however. Fits great, is comfortable and really keeps outside noise out. Looks good and the flip down visor is a great touch. Only complaint is it fogs up really easily. Wow. Totally Impressed. Quiet, high quality. For comparison, I owned a RF1000 since 2007. Used if for 3 years, retired from riding for 8 years and bought a bike again recently. I have a 42mi commute mostly highway with a CBR300R sportbike. To be fair, I also started usign a tank bag at the same time, so aerodynamics could have changed, so might need to amend the review after I take it off. Really, really quiet. Like I'm going 15mph slower or have a taller windscreen. SO quiet my stock exhaust sounds great can really hear the induction noise that makes the little single sound like a sportbike. Stability/turbulence - huge different especially following other cars. Excellent quality, you get what you pay for. Really like the bright red and white color scheme. Not boring, high visibility without being high viz yellow and still matches the bike. Internal visor is smooth operation and large coverage. Could be darker. Screen fogs up easier (haven't installed pinlock yet) than my RF1000. Could be the tank bag though. Lower detent is a little high. The neck padding that makes it quiet, makes it harder to get on, but I'll take it. Fit seems about the same as my RF1000.... just not broken in yet. I would advise against going up one size. Nothing is worse than a loose fitting oversized helmet once broken in. Actually I suspect that those with noise issues, went one size too big. Neck needs to be snug and totally gap free aroudn hte sides where turbulence creates most of hte noise and sounds reaches your ears. Ordered this helmet on Closeout and even then it is the priciest helmet I have have purchased. But in this case I figured that my head is worth more than 500 bucks. As others have mentioned it is one Shoei Helmet that runs a bit small compared to let say even the Neotec. I tried both on in a store and the Neotec fit perfectly in XL but the GT-Air uncomfortably tight in XL. Tried on an XXL and it fit like a glove. The Quality is First Rate. I really wanted to buy the Neotec but at close to $200 dollars more it was a no brainer to buy the GT-Air Expanse in Red and Black. Great color but not my first choice. I have a Matte Black and Kawa Green Vulcan S Cafe and really wanted a helmet to match but it wasn't available in my size. The helmet itself is super light and very quiet. I was wearing an inexpensive HJC CL-17 and there is no comparison. The HJC feels like a brick compared to the Shoei and I didn't realize how much noise it lets in until I was riding with my Shoei. Day and Night difference. Field of vision is also way better and the pull down visor is a nice touch which safes me from wearing sun glasses or switching to a tinted visor. Airflow is very good to exceptional and with the Pinlock insert in place there is no fogging at all. Well, to be honest the pull down visor does fog up a little but only on very cold or humid days. I will be adding a Sena 30k in a couple of weeks and it should be easy with the ear cut outs for speakers. 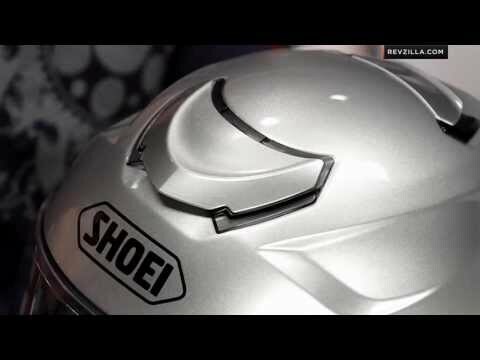 Seems Shoei thought of everything when designing this helmet. Comfort, Style, form and function. Bravo Shoei, Bravo! I've had Bell helmets, Shark Helmets, HJC helmets and SHOEI helmets. SHOEI, has the cheapest and most generic feel. I couldn't get the breathe guard on this one to snap in place but most of all, I couldn't get over how cheap the materials felt. Don't get me wrong, it is comfortable, has great ventilation, features and graphics, but for the price point I'd rather go with a SHARK or BELL. SHARK uses high quality materials and feels super high quality for half the price, I've mever had any issues with their components and most helmets come with the ratchet strap. BELL relatively the same price tier and is super high quality, superb ventilation. I'm a big fan of Shoei helmets, especially the GT-Air because of the internal sliding sunscreen visor. Additionally the helmet has good sound protection from wind noise (although I don't recommend riding without ear plugs at highway speed), excellent visibility, and the pinlock visor layer actually does a great job at eliminating fogging (compared to a Shoei Qwest helmet without pinlock). I love the graphics on my GT-Air Expanse (red and black). However, the main reason for this review is to warn you about the sizing. I bought the GT-Air Expanse in XL thinking it would fit just like my GT-Air (standard/solid color)--wow, was I wrong. An XL in the GT-Air Expanse is basically one whole size smaller than the same size in the standard (solid color) GT-Air. So if you wear an XL in the standard GT-Air I recommend you get XXL for the GT-Air Expanse. What is the point of standardized sizing if you can't even get the same sized helmet in the same model from the same manufacturer just with different graphics? Unfortunately I removed all the labels and packaging and put the helmet together before realizing that the sizing was completely off so I'm going to have to live with the manufacturer's error. Hope this helps you get the proper size! I had been looking at this helmet for awhile and reading the reviews before finally purchasing it. The helmet does fit very well and after a short break in period you will not need to put your hand on top of the helmet to force it on your head. The wind noise compared to my last helmet is slightly less, but if you happen to lose an earplug, you will definitely know it by the end of the day. There is a slight whistling heard when you have your head at certain angles, chin slightly tucked is the best to prevent this. The airflow is great across the top of the helmet, not so great in the face area. I bought the helmet in late fall and below 40F the faceshield fogs and you have to crack it when moving to get the faceshield to clear, while at the same time the top of your head is getting a little icy. That brings up the pinlock, I missed the fine print saying it dangerous to use after dark ( tinting obscures road) and have not been able to see if it really can reduce fogging. Graphics of the helmet works with the high visibility scheme I have on my bike really works well together. Love the side lever to raise and lower the visor, the last helmet had this lever top center and was a pain at higher speeds. Overall this helmet is a solid product, just a little timid for late fall and early spring riding. Will cause me to look into possibly a second helmet for those times of year. For the record my daily commute covers back roads, city and freeway riding and I average 11k miles a year in the upper Midwest. I leave the house at 5:30 and return after 6 pm. My equipment has to work. I tried all the high-end helmets and liked the GT-air the best out of the lot. It does run small and ended up ordered an XL, while I normally wear a LG. I also added a little extra padding in the top and it now fits perfectly. Glad I got the Expanse, red, green, white one. Complements my Ducati MTSE very well. It's a great looking helmet! It matches my CBR paint scheme perfectly. But must importantly is the fit and safety rating of the helmet. My head-size is on the border of size small to med. I ordered a small just to ensure a snug fit. When I tried it on for the first time I thought my head was going to explode! It was very snug, more so then I've ever experienced with a Shoei in times past. I had to exchange the check pad set with Shoei to the thinner set, also I purchased the thinner top crown pad. After I installed these pads in place the helmet fit glove-like without the extreme head-popping pressure. Just be forewarned, this helmet does run smaller then older model Shoei's. I can see!!! Peripheral vision is awesome. Looking up in crouched position. Flip brown visor, how did I live with out it? My overall impression of the helmet is very good. The vents are awesome and they are easy to open and close while you're riding wearing gloves. The helmet is also quiet, more so than my RF-1200. My personal downside to this helmet is that it is very tight fitting as you put it on. I have to wiggle the helmet and turn my head from side to side once I have it on in order to unfold my earlobes.